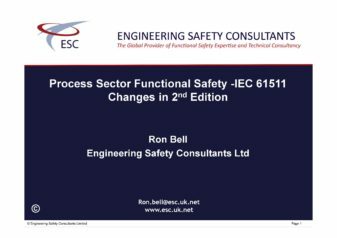 Presentation given by ESC’s Ron Bell on the changes in IEC 61511 2nd Edition. Enter your name and email address to receive free download. Please also subscribe to our monthly newsletter. We promise not to inundate you with emails – we hate spam as much as you do - and you can unsubscribe any time. Please read and tick to confirm you agree to our Terms and Conditions.